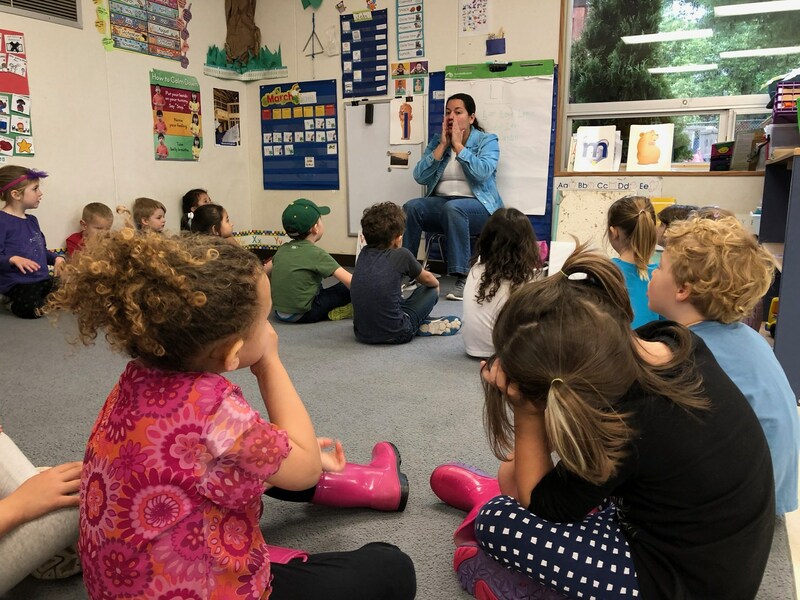 Arcata Elementary Preschool participates music instruction twice a week from our district's credentialed music teacher, Mrs. Lo (currently Mrs. Cherry). Students learn basic music concepts such as echoing rhythms, tone matching, tempo, style, and loudness while learning the musical language. Our students sing songs, play music games, and use musical instruments such as tone blocks and tambourines. Melody is a stuffed elephant that does movements when children sing to her. EX: Melody do a flip (with a sing song voice). Dotty is a pig toy the "oinks" when you squeeze it. Perfect for echoing rhythms. Bunny jumps up and and down while the kids voices match pitches. Salty the lobster hand puppet teaches the students signs for Do, Ray, Me. 1. Music encourages children to move. Movement and music are as closely connected as movement and learning. At a time when there are increasing concerns about how long these young children are being required to sit still, being able to move to music is a gift. 2. Music fosters a sense of community and belonging. At the core of every human being is a desire to belong. When that need to belong is fulfilled, it contributes to healthy emotional development and well-being. Self-confidence grows as a child learns to function within a group. And there’s no happier group experience than making music together! 3. Music provides an outlet for self-expression. With gifts, experiences, thoughts, and ideas that simply overflow, a music class offers a secure environment for each individual child to explore, learn, and contribute. The value is in the experience itself with play, discovery, singing, story telling, and new challenges as the tools that open the door for self-expression, meaningful learning, and a lifelong love for music. 4. Music readiness and academic readiness go hand-in-hand. The same skills and experiences necessary for a child to be ready for music lessons when they are older are the same skills and experiences that enhance and even accelerate academic readiness and success. Listening, identifying patterns, problem-solving, creative thinking, and self-confidence are skills that music develops – skills that are also a measurable contributors to academic achievement.